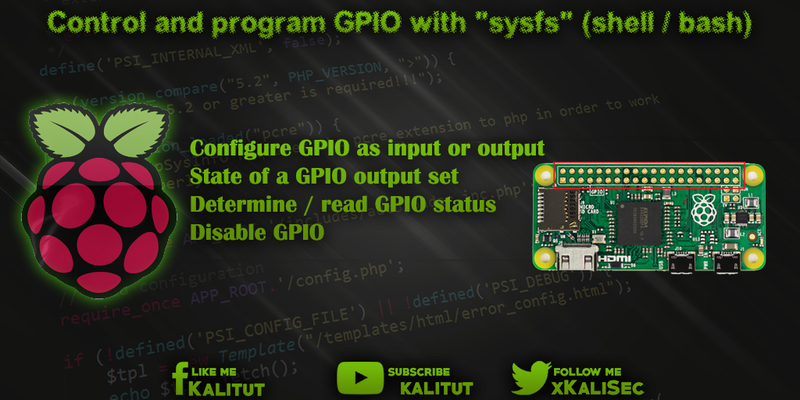 The GPIOs are represented on Raspberry Pi as files and can be found in the directory tree under "/ sys / class / gpio". This is called "sysfs". If you look at the contents of the files, you get the state out. This is either "1" or "0". When controlling and programming you have to make sure that you do not choose the pin number, but the BCM number of the GPIO. In the following example, we configure the GPIO 17 (pin 11) as the output and the GPIO 18 (pin 12) as the input. Note: Programming the GPIOs via "sysfs" is not recommended. The recommended way is with the command line tool "pigpio". To configure a GPIO you have to create it first. Then you decide on the direction. So either as input or output. First, we turn on the "GPIO 17". If the GPIO is to be configured as an input, the following command applies. If the GPIO is to be configured as an output, the following command applies. A GPIO configured as an output should then be given a status, ie "high" or "low". The output is "1" for "high" or "0" for "low". If you no longer need GPIOs, then you should disable them. The following commands will cause the files and directories of the GPIOs to disappear. When restarting, the GPIOs are automatically reset.